I love my iPhone 3G and can’t wait until the end of my contract when I can upgrade to the latest and greatest version. However, one of my biggest gripes with the iPhone is that there is no standard way to backup and save your text messages in an easy-to-read fashion. After much searching, I’ve finally discovered a great application for backing up your messages. I’ve also combined that with a little web development trickery to convert the final product into a self contained and beautiful HTML file. First off, you need a way to export your text messages from either your phone or your backup. All the messages are backed up on your computer with the normal iPhone sync process, but they aren’t in a format that is readable for humans. There are several different software applications that will do this for you. I’ve tried a few different ones with varying success. Most of them seemed downright kludgy. After trying out several apps, I finally discovered Decipher TextMessage from Decipher Media. It is very modestly priced at $6.99. Decipher TextMessage is an OS X only app (sorry Windows users) that simply pulls your text messages out of your iPhone data backup file. I like the idea of this because it’s only messing with the backup file, not your actual phone. The great part about Decipher Text Message is that it uses your address book to match up phone numbers with contact names. All texts are sorted into conversations with each contact. You can then easily select a conversation and save it as either a text file or a CSV file. For this method, I just exported the conversation I wanted as a text file. The text file is great, but if it’s a long conversation, it’s going to be hard to read and not terribly useful. This is where a little regular expression kung fu and some HTML and CSS love come in handy. Me: Do you still have that spare ticket? Johnny Appleseed: I dont BUT if you want to go I can probably grab another. Me: What time is it at? Me: Hmm. I think I'll pass. I got into work late today so should prolly stay until at least 8. Have a good time though! Johnny Appleseed: Mmmkay. :P Perhaps next time. Me: I just got home. Me: Oh yeah? Who you out with? As you can tell, although there is a lot of text, it’s all in a very predictable pattern. One part at the top, dates, texts from your contact, and texts from you. As you can see, I deleted the first line from the text file that said “Conversation with: Johnny Appleseed (5555558555)”. I don’t need that for this case. If I had wanted, I could have used that as the title of the document. I’ve also changed the extension of my document from .txt to .html. Next up is putting all of our text into HTML tags. Now, for any conversation that is more than a few texts, doing this by hand is just out of the question. That’s where some regular expression kung fu and my favorite find and replace tool come in handy. For this job, I use TextWrangler from Bare Bones Software. It’s a great free text editor that includes the best search and find and replace tools I’ve found. In my opinion, it’s much better than the search tool for TextMate, which is the editor I use for pretty much everything else. The first thing we’ll do is reduce the length of the file by getting rid of the extra line breaks. The line break pattern will match our line breaks. We just use \r for this. We want to end up with just one line break after each line with text and no empty lines. We do this by searching for two line breaks in a row and replacing them with one. Doing “Replace All” once on this search will give us a much more manageable file length. Give each of the paragraphs two clases: ‘message’ and ‘me’. Change the starting label from “Me:” to be my full name instead. Enclose my name in a strong tag. Give each of the paragraphs two clases: ‘message’ and ‘you’. Enclose the other person’s name in a strong tag. We’ll use almost exactly the same search pattern as the last time, except this time I’m using Johnny’s name instead of mine. Just substitute the Johnny part for whoever the conversation is with. Here are screenshots of each of the last two searches in TextWrangler. And there we have it. Just a small bit of regex kung fu has given us a fully marked up HTML document. This is a great start, but in order to make it actually usable, we have to add some CSS styling to it. Here’s what are document looks like so far. For the purpose of this conversation, my goal was to make the HTML page mimic the look of the iPhone text messages. I also want to make the HTML page self-contained, so I’m going to use internal CSS styles for everything. The first thing is to add some very basic styles to the body element. Here we are setting the background color and fonts. We also use the margin: 40px auto; to center the page and the width property to give us a nice narrow page width for our conversation. Next we should style the strong tags. In this case, I want the strong elements to have a normal font-weight, but to be a different color. I styled all the strong elements as a medium gray color and then used the me class to override the the gray color with a bright green for my texts. Now that we’ve done some basic styling, we can start mimicking the speech bubbles. First we’ll style the message class to give some padding and rounded corners. We’ll also set the max-width of the each message to 70% so that it will stretch only slightly less than three quarters across the page. Notice that I also tucked in a float:right to the ‘me’ class. This will set my speech bubbles off to the right of the page. Using just these few styles, we’ve created a nice looking self contained HTML page displaying our exported SMS conversation. Take a look at the HTML page so far. We could stop here and the page would be fine. However, we’ll use some really fancy CSS border trickery to make the text bubbles looks just a little bit better. Using images would make the text bubbles perfect, but remember, we want the file to be self contained. You can see the finished effect on this page. So with just a little bit of work we’ve marked up our conversation into HTML and created some advanced CSS styles to put our entire text conversation into a nice self contained HTML page that should be easily viewed in browsers for years to come. Even better, we’ve made the CSS generic enough that we can just copy and paste it into another conversation we’ve marked up using HTML. Obviously, there are a few caveats here. 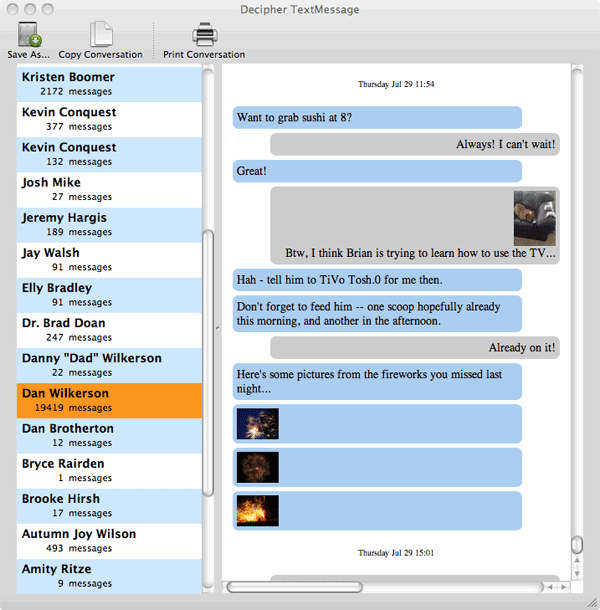 The Decipher Text Message program only on works on Macs. I haven’t tested any Windows-based software for the same purpose, but I stumbled across quite a few of them when I was looking for the software, so there are definitely options out there. Also, we’ve used some pretty complex CSS and several CSS3 properties that aren’t fully supported by all browsers. I have tested this in Firefox, Chrome and Safari. Hopefully things shouldn’t look too terrible in other browsers. I confess though, I did not even check it in IE.